18,000 years ago, a vast ice sheet covered most of Chile and Argentina. Today, the Northern and Southern Patagonian Ice Fields are all that remain. Together they form the world's third-largest continental ice sheet outside of Antarctica and Greenland. It is a pristine and dramatic landscape made up of ice, rock, glaciers and fjords. Where is the Patagonian Ice Field? The Patagonian Ice Field forms the largest mass of ice in the Southern Hemisphere. It covers an area of roughly 8000 square miles, spanning the border of both Chile and Argentina. An Ice Field is a large body of ice that forms at high elevation and is drained by smaller outlet glaciers. These glaciers flow into the fjords on the western side in Chile and into gigantic lakes on the eastern Argentinian side. The constant advance and retreat of these glaciers have torn apart the landscape, forming steep valleys and deeper fjords. Ice Fields have mountains and ridges that jut out and influence it's flow - in Patagonia these are known as Nunateks. At the height of the last glacial period, the Patagonian ice sheet covered all of Chile south of Puerto Montt and the western edge of Argentina. Today, just 4% of that ice sheet remains in the form of the Northern and Southern Ice Fields which are divided by a 90km stretch of fjord. 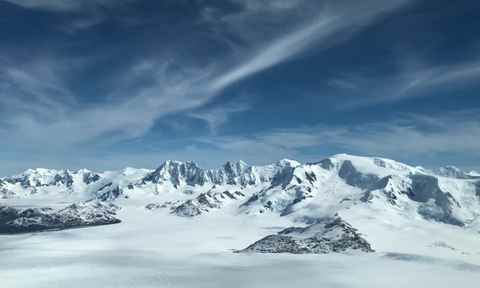 The elevation of the Ice Field in the Andes mountain range (1,500m above sea level in some places) means there's a high volume of snowfall - this ensures the Ice Field's overall survival. The Southern Ice Field is almost three times the size of it's smaller northern sister and is more accessible given it's proximity to popular National Parks like Torres del Paine and Los Glaciares. Like all ice masses around the world, the Patagonia Ice Field remains a threatened environment, with climate change more than doubling the pace of glacial retreat over the past two decades. In November 2017, an abnormally large iceberg measuring 350 by 380 meters calved off from the front of Grey Glacier in Torres del Paine National Park. The story made world news as hundreds of international hikers circulated photos on social media. Altogether, Patagonia's two ice fields account for about 10 per cent of the total sea-level rise caused by worldwide glaciers. On the other hand, there are some glaciers on the ice field which remain stable, the most famous being Perito Moreno glacier. Exploration of the Ice Field did not truly begin until 1914, when German mountaineer Federico Reichert reached the 1500m high plateau of the Southern Ice Cap via the now famous Perito Moreno glacier. Later in 1931, Father Alberto De Agostini, an Italian missionary, became the first person to cross the Southern Ice Field from east to west, climbing from Lago Argentino to Falcon Fjord on the Pacific in just 20 days. The most famous of Ice Field adventurers is the legendary English mountaineer Eric Shipton who led several successful expeditions. In 1960, Shipton together with fellow Englishman Jack Ewer, a professor at the University of Chile and accomplished Chilean climber Cedomir Marangunic completed a 52-day crossing of the ice field from Jorge Montt Glacier to the edge of the Upsala glacier and over a series of peaks, including Cerro Murallon. Shipton later crossed the Northern Ice Field from west to east, starting at San Rafael Glacier and finishing at the Cochrane river, making the first ascent of Cerro Arco in the process. Modern-day Chilean mountaineer Pablo Besser is the only person to have completed what he dubs the "Grand Slam Patagonico", completing a longitudinal crossing of both the Southern Ice Field (1998) and the Northern Ice Field (2006). He has completed four expeditions to the Southern Ice Field and five to the Northern Ice Field in total. The Patagonian Ice Field largely remains a frontier landscape, with part of the border still not agreed upon by Chile and Argentina. A particular point of contention is a 50km stretch of border between Mount Fitz Roy and Cerro Murallon which remains the only contested area following the demarcation of 24 disputed borders in 1990. Territorial disputes remain unresolved as each country eyes the enormous freshwater resources preserved in the glacial ice. Both Chile and Argentina have declared the Ice Fields as National Parks. The Northern Ice Field is absorbed by the Laguna San Rafael National Park whilst the Southern Ice Field is contained by the boundaries of Bernardo O'Higgins, Los Glaciares and Torres del Paine National Parks. Many are calling for more environmental restrictions, protocols and regulations to protect these delicate landscapes. The Ice Field is a mountaineer's playground. Ice-clad peaks, colossal glaciers and endless crevasse fields remain largely untouched offering adventurers an extraordinary connection to nature in it's most primitive and powerful form. Patagonia's regions are diverse and each area offers something unique. Take a look at our recommended places to go for the activities you want to do, and let us help you to find the perfect destinations for you.